Quite possibly the most famous name in cigars, the Dominican Cohiba is a deeply satisfying cigar, rich in flavor and history. Each Cohiba Red Dot cigar is carefully crafted with smooth-smoking Dominican Piloto Cubano filler leaves and rich Cameroon wrappers for a relaxing and well-balanced smoke that pays homage to its Cuban counterpart. Here's what others have to say about this item! An outstanding cigar at a reasonable price. These cigars always have a smooth even burn as well as flavor from the start all the way to the finish. While cigar smoke can sometimes be a turn-off, the ladies find the aroma of the Cohiba Red Dot Churchill very appealing. Very smooth and flavorful smoke. Very well constructed with an even draw and burn. A very full flavored cigar. Would highly recommend this cigar. Great cigar. Mighty expensive. But if you want an excellent smoke, this is it. This is a medium bodies cigar that smokes evenly to the end. The Red Dot Churchill is a well crafted balanced cigar worthy of the Cohiba name. A good second choice for me to mix things up a little. 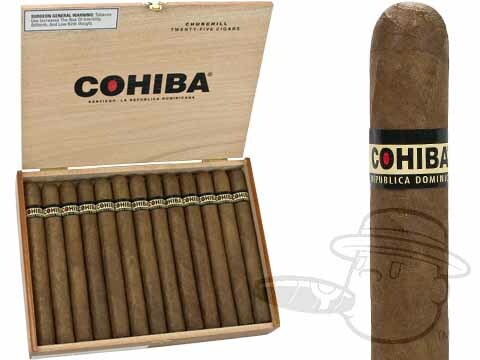 Cohiba Red Dot Churchill is rated 4.6 out of 5 based on 9 customer ratings.